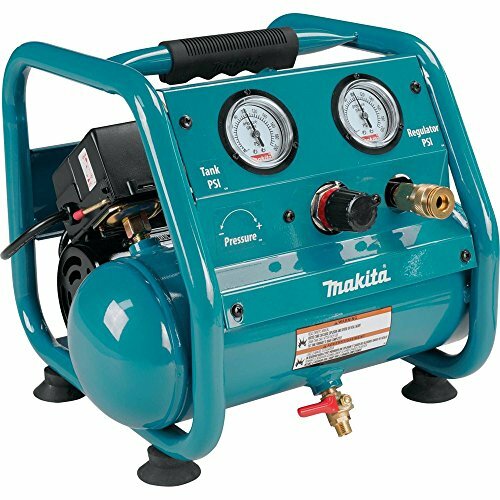 For a powerful single tank air compressor, the Makita AC001 could be exactly what you are looking for. It provides 125 PSI with its impressive motor while keeping the noise level reduced. This makes it a great option for indoor use or for use within built-up areas. It also means that it is great for ensuring the aural comfort of the user, as is stated on the Best of Machinery website. The Makita AC001 has been well designed, is aesthetically pleasing and is impressively lightweight at just over 23 pounds. This makes it an ideal air compressor for anyone requiring easy transportation of an air compressor for use in multiple different locations without encountering difficulties moving or lifting the compressors itself to relocate it. The Makita AC001 is a low amp drawing air compressor which means that there are very rarely reported incidents of tripped breakers. It has a lever handle ball valve within its tank which helps to release the air tank easily and quickly. The Makita AC001 is an easy to maintain piece of equipment which has been created with a roll cage so that the pump and motor are fully protected. This is a corded electric air compressor, so it is easy to use in any location so long as there is an appropriate mains electricity supply. This is a very lightweight air compressor at just 23.1 pounds so can be transported to any location with great ease, causing no physical damage to the compressor or to the user when in transportation. Can be used anywhere that there is a mains electricity supply. The Makita AC001 is very quiet so is ideal to be used in indoor situations without causing damage to ears or putting the hearing of the user at risk. The roll cage is a clever asset to prevent any damage from occurring, fully protecting the pump and motor no matter what scenario they are used within. Some people find it restricting to have a corded air compressor and there is a risk of tripping over the cord, but this is not something that should put off users. There are air compressor available which are able to provide more than 125 PSI but this only matters if you are doing a job which requires a greater power output, with 125 PSI able to undertake the majority of layman jobs. This air compressor is the perfect machine for anyone who works within enclosed or confined, indoor spaces who wishes to keep noise levels to a minimum and protect their hearing and the hearing of others around them. As the Makita AC001 is so light, it is perfect for people who require an air compressor in multiple different locations as it is easy to lift, easy to move, easy to relocate. It does not take any time to set up this air compressor in a new location – it just needs plugging into a new mains electricity point – and it can be moved by a single user. Great in scenarios where there may be a higher risk of damage occurring to machinery, such as on a building site, mechanical garage or farm, as the roll cage protects the pump and motor from being damaged. This means that technical difficulties are very unlikely to be encountered and the Makita AC001 remains safe to use even if it has been knocked by other equipment. We like the Makita AC001 because it is so lightweight but remains so powerful despite this. We also love that the roll cage protects the motor and pump so well that safety and effectiveness can be guaranteed even when the air compressor is used in busy workplaces, such as building sites, where accidents can easily happen and equipment gets knocked or damaged frequently. The roll cage prevents this from happening and therefore stops costly repairs or new parts from being necessary. We hope you enjoyed our article on "Makita AC001 Review & Buyers Guide", if so, please share and rate it.